The very lovely 3D handcrafted Angel Feather card is a standard sized card, 5.5 x 4.25" with matching envelope. It is enclosed in a sealed plastic bag and shipped in a protective bubble envelope. This beautiful, one of a kind card is made with heavy purple cardstock attached to a customary white greeting card. The card is blank inside for you to add your own personal sentiment. 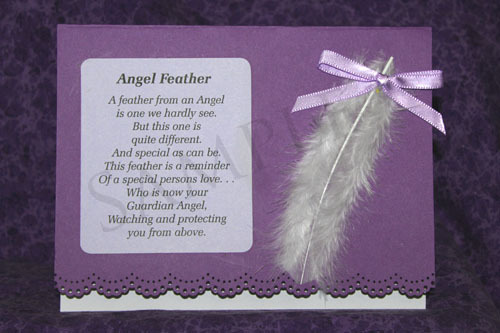 Attached to this card is a short Angel poem along with a white feather garnished with a purple bow. At the bottom of the cardstock is a decorative scalloped border. The Angel Feather card would be time-honored for occasions such as Christmas, Sympathy, Friendship or any special day. An ornate frame could add just the right touch for hanging on a wall or sitting on a shelf. This card can be made in most other colors if requested.